Pen and brown ink and gray wash over leadpoint; verso: leadpoint. 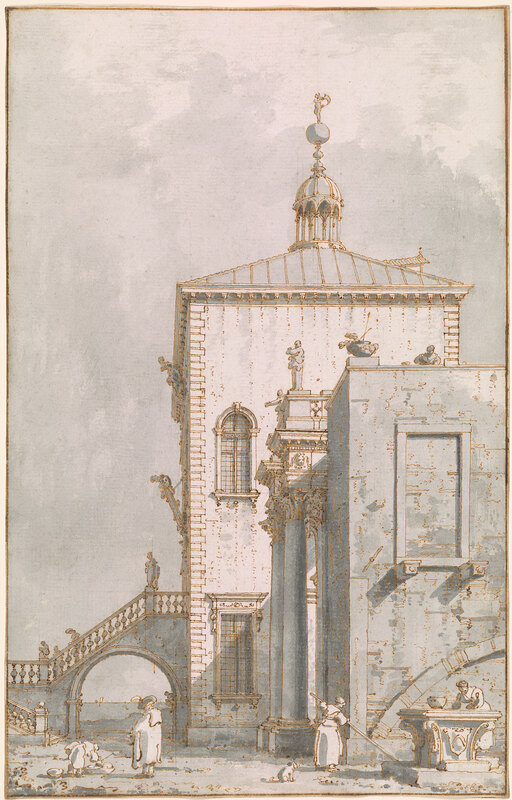 This beautifully preserved, highly finished drawing is typical of Canaletto’s late work in using brown ink in combination with gray wash and in allowing the white of the paper to convey the sense of sunlight playing over masonry. 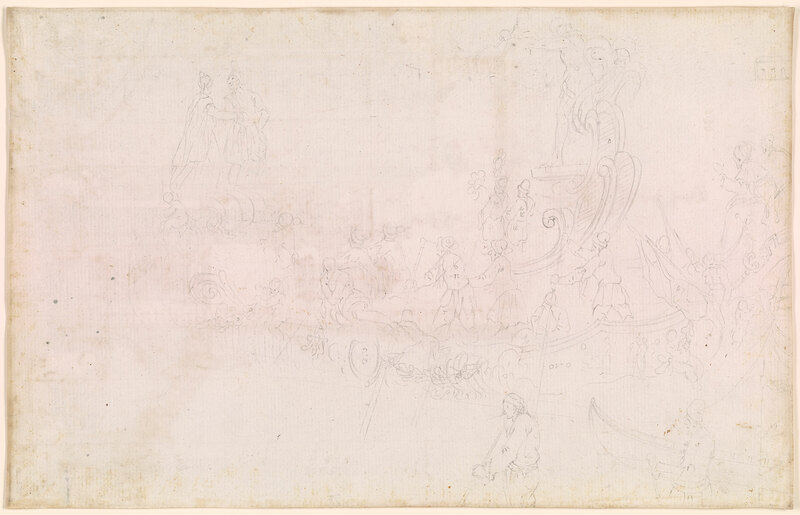 It is a capriccio, a fantasy: the structure is an imaginary building in the style of the Renaissance, although it is inspired by Venice’s Dogana da Mar, and is crowned by a statue of Fortune that derives from the allegorical figure atop the Dogana. As often in Canaletto’s work, everyday figures and a dog enliven the foreground. Signed on the wellhead in the right foreground with Canaletto's coat of arms, the chevron. Inscribed on verso, "oro" and letters indicating colors, "n" (nero, black), "o" (oro, gold), A (argento silver), u (verde, green)". London auction room, ca. 1925 (according to Constable); Robert Dunthorne, London; Dudley Tooth; Mrs. Dudley Tooth; Arthur Tooth & Sons, London; Eugene V. and Clare E. Thaw, New York; Eugene Victor Thaw Art Foundation. Watermark: three crescents (Ruth Bromberg, Canaletto's Etchings. A catalogue and study illustrating and describing the known states, including those hitherto unknown, London & New York, 1974, p. 185, no. 6). Executed by the most distinguished Italian view painter of the eighteenth century, this highly finished drawing depicts a Renaissance-style tower surmounted by a figure of Fortune. Although the pavilion is likely imaginary, the figure of Fortune copies that on a tower of the Dogana da Mar in Venice. The cartouche bearing a chevron on the wellhead at lower right is the coat-of-arms of the artist's family, a device he often used as a signature.